The idea of eating insects isn't new -- there are several cultures around the world that actually rely on them as a major food source. But those in the Western world haven't quite caught on, and that's a bit of a shame. See, insects cost a lot less to produce and are far less harmful to the environment than raising livestock. Katharina Unger thinks so too. Not only that, but she also thinks that people need be more informed about where their food comes from. That's why she and friend Julia Kaisinger created the LIVIN Farms Hive, which is what they're calling the first ever edible insect desktop hive. With it, the two hopes to spread the gospel and value of growing, breeding, harvesting and, yes, eating your very own mealworms. The hive essentially acts as a fancy ant farm, except instead of ants, you're breeding meal beetles (Tenebrio molitor). When you get the hive, you'll also receive a starter kit filled with beetle pupae. The pupae then hatches into beetles, which then reproduce and lay eggs that hatch into larvae, or mealworms. The hive is climate-controlled with fans and sensors to reduce smell. You're then supposed to feed the mealworms kitchen scraps like leftover oatmeal or potato peels -- thus reducing more waste -- and after a bout a week, as the worms drop from layer to layer, you can "harvest" them. As for any waste, you can simply discard them or use it as compost or part of your soil. Additionally, some mealworms will be separated in the harvesting process and turn into pupae. What do you do with the pupae? Well, you simply put them back at the top of the hive, where they'll hatch into beetles and start the whole process over again. It's a system that should guarantee you mealworms each and every week just from the first initial purchase. A week's harvest produces 200-500 grams of mealworms. This, according to Unger, requires ten percent of the land and a quarter of the feed that cattle would need. Kaisinger tells me that the mealworms are really a super food. They have a similar protein content to red meat and the same beneficial amino acid profiles of tofu. They're also a nutrient powerhouse with plenty of vitamins and enzymes, she says. With about 500 grams of mealworms a week, you can substitute the meat in four to five mixed dishes. 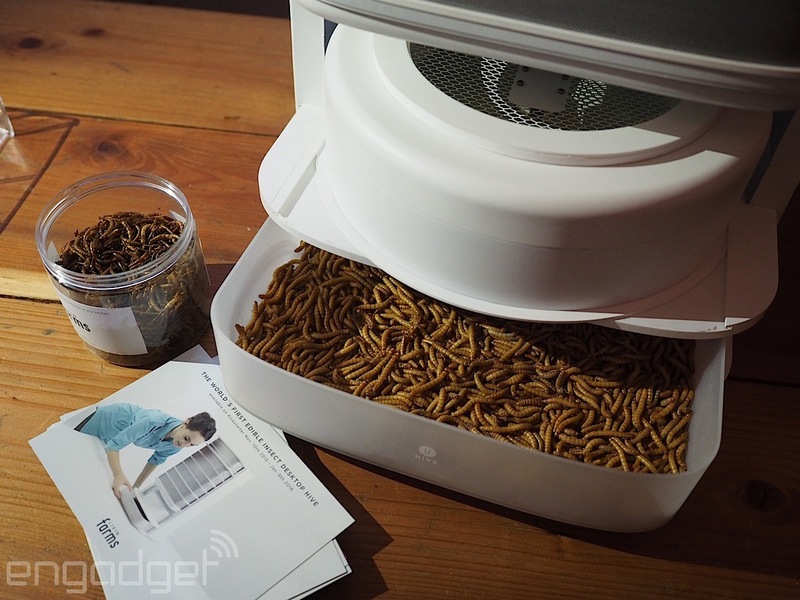 I tried a few mealworms at a HAX event in San Francisco where Unger and Kaisinger were showing off the hive. It was crispy and nutty, and reminded me a lot of fried onions. I liked it more than I thought I would. Kaisinger says that the worms can be made into burger patties, toppings for salad, and more. Still, the concept is a tough sell for a squirmy Western world that's largely afraid of creepy crawlies and bugs. It's an even tougher sell considering one of these LIVIN Farm Hives will probably cost around $700 at retail (There's a $500 early bird promo on its Kickstarter page), even if $700 supposedly buys you a lifetime's worth of never-ending food. Indeed, the Hive is only about $25,000 into its $100,000 funding goal, which means it's not too popular, at least not yet. Yet, it's an intriguing idea, and it's one we haven't seen before. And even if you're not keen on buying a Hive for yourself, you can still pledge about $25 to get a little pack of tasty mealworms as a treat.